Hand made wooden doll’s cradle with two rockers. Sides extend into curved wood with scalloped edge. Hand made in England 1860-1870. Bedding c1970s of pink, white and green poly cotton. 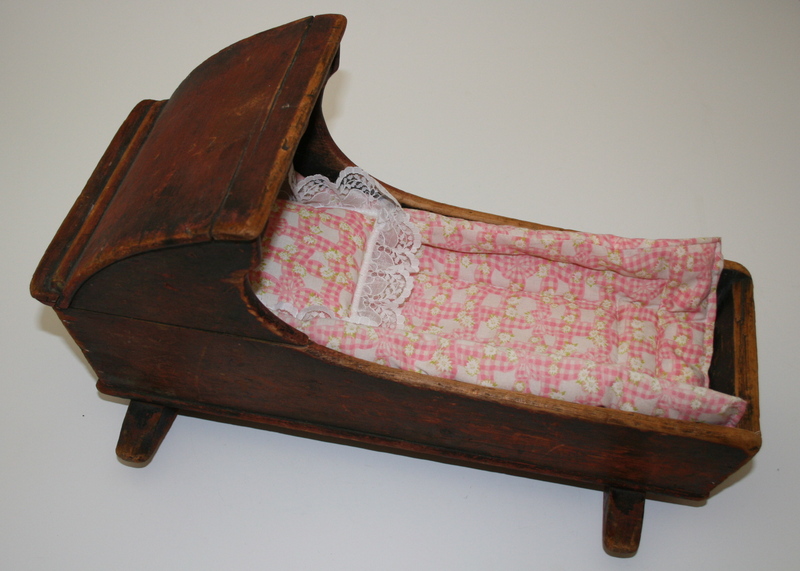 The dolls cradle was hand made in England in c1860-1870 for Norma Roach’s Great Grandmother and played with by generations of the family until the 1970s. The dolls cradle illustrates a link to Norma’s family in Sunderland and of course the family she raised in Queanbeyan. Norma, from County Durham England met her Australian husband Trevor Roach while working as a nurse in London. Norma arrived in Queanbeyan with Trevor in 1958. She is heavily involved in the Queanbeyan community perhaps most famous for helping to found and support the Queanbeyan Players, the very successful local theatrical and musical group and also for her advocacy for the Queanbeyan’s modern theatre in Queanbeyan The Q.